today, just a quick post. 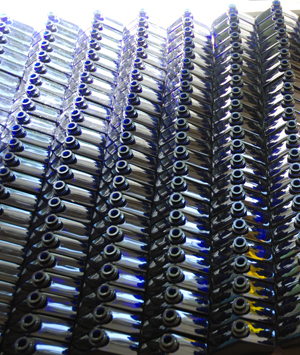 Although it is still pretty early: I need to head to the factory and fill air in to bottles. And then put air into boxes. For this, I am printing cards right now, on my laser printer, that miraculously accepts the thick paper, which is right beyond its specs... although, funny enough: it only accepts the one side with the tauer logo in silver if put in bottom to head, not head to bottom like I should. Thus, we had to turn all label information that goes on this side by 180 °. The silver logo seems to confuse the paper detection thing. Well, must have to do with the past of the printer: It was standing in the offices of the Swiss Federal Bank. And wasn't really used there. Do I like it. Yes. Do I love it. No. Could I go with it. Don't know. What's missing? It is too geometric. Too nice without being creatively brave. It misses a few elements that render it "different". I have a few ideas, though. I am considering cutting the square pictures and bring in some round forms, some background elements, maybe changing even the format from A5 to A4, allowing me to go bigger with the main pictures and still have enough room for the text. We will see: I just wanted to share this with you. It is like with perfumes and their creation: even if you like a particular scent, even if you think, it is "OK", you do not really love it. And this is not enough. 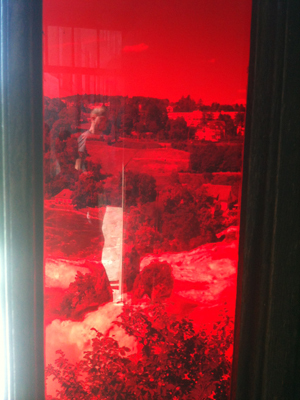 today's picture shows you the Rhine Falls (Europe's largest plain water fall near Schaffhausen, Switzerland), seen through a piece of red glass in the window of one of the observation desks. (the picture is proof of my 80 km biking trip yesterday) The world in red. But not seen in red through some sort of digital filter but for real, through real red glass. Red glass, by the way, is pretty rare and I cannot get a red flacon due to restrictions in the use of heavy metals that render glass dark red. Anyhow: The world seen through a red glass makes it look quite different. The blue sky and the green pastures and trees all look red or dark reddish spots which actually makes the tree stand out a bit. Actually, a red filter would help a lot to find the important shapes when trying to paint a natural scenery. At least the way I look at it. The same experience you would make, I am convinced, when applying a new interest filter to your life. Start painting or doing illustrations: The world will break out in light, in colors, in shapes and contrasts and textures. Start creating perfumes and the world will develop in front of your nose in scents. Start writing and the world will be words describing it. I am convinced that for most of us, there are a lot of parallel universes out there, ready to get explored by us, if we dare. Right now, after meeting with my designer, Donovan Gregory from the Designer's Club, my world is packaging. We met on Friday, and Donovan presented details about all the major items I want to get changed: The tin box, some labels, a little product brochure and we both realized how complex the map of tauerville got in the last three years. We are trying to simplify a few things, or better said: Simplify the handling for Andy. But things look very promising. Here 's the plan for the next weeks: We will continue working on some details of an alternative tin box that -as explained earlier- is a bit smaller, rectangular, and easier to stock and pack and handle. We will get another model of it and then, in late summer, we will start production of it, with delivery in winter 2012. As soon as the box is "out of our way" we will need to decide on labels and paper. Thus, the world around me is packaging, with a hint of gardenia, where I am trying to come up with a starting point how and in which combination to use my gardenia base that I built. Ah and yes, the world is filling perfume bottles. But that's nothing new. ZETA - a linden blossom theme- today. design , making of , what's up? 290 g/m2 paper, perforated at most of the folds to help and ease the folding. The paper is 290 gram per meter square as we should not put on too much weight, for postage fee reasons. 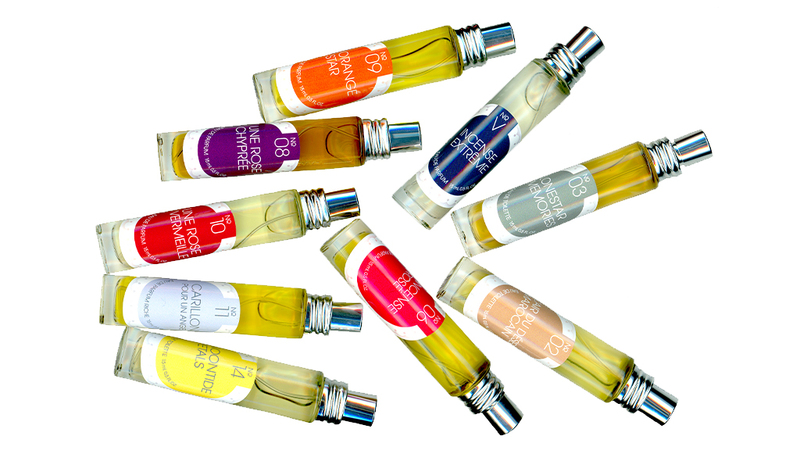 There is a limit of 500 gr for the packed and ready to ship perfumes. Beyond these 500 gr: Think double postage. Yep. The test was: Sitting in a coffee shop and shaking the packed perfume. Like flying from here to there, back again, sitting in a truck and ultimately being thrown into a corner. It sure survived, but you could see weak corners where the paper started to give in to the stress imposed by the flacon. To be on the safe side: Another round of thinking and fiddling ahead! The previous version was not perforated, but just embossed a bit, helping a bit with the origami like folding. But it was not good enough. Hence, the perforation. With the perforation on the other hand, the paper is a bit on the weak side. Thus, we will try different paper, slightly more heavy duty, some papers with a different structure, such as a impregnated surface. Well, in the end it may sound like a detail, but then: It is the details that matter. Sometimes. 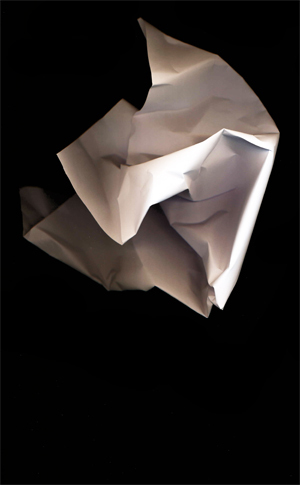 Today's picture shows you random origami: A random folded piece of 80 gram/m2 paper, scanned. Paper is a wonderful, almost magic material! Today, we will pour a lot of RÊVERIE AU JARDIN into flacons, because we see yet another mini boom for the Rêverie, and put the NEW design wooden tops onto the top of the filled and crimped flacons. These black top covers are made from beech wood, by the way, by a family owned Austrian company, Leitner Design, and if you ever look for design and manufacturing competence in wood: Go there! 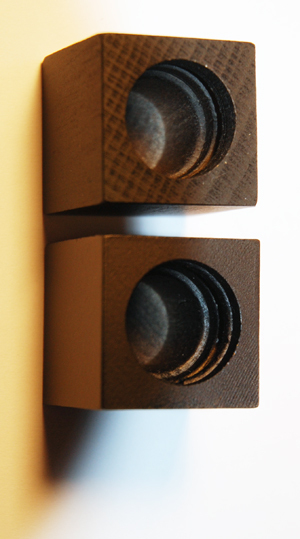 The picture to the left shows you a prototype of the adjusted design. 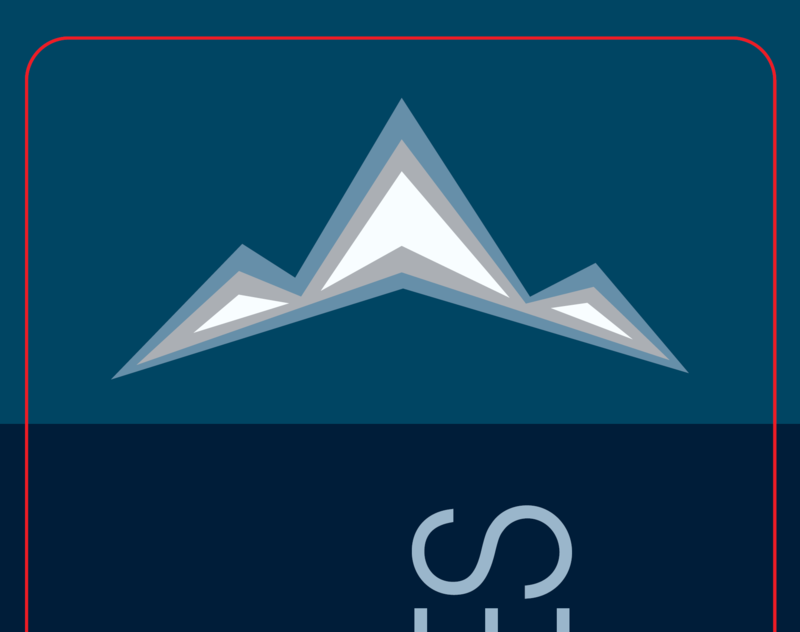 The new design is on top of the "old" design. We got rid of a wood rim and change to O-rings around the flacon's neck to a thicker diameter and from now on: The cover tops stick. It sticks really well, without being to hard to remove. Actually, you need to turn them a little bit in order to put them on top or getting them off. But the bottom line: They stick better now. It was a little flaw that we corrected and praised be the W.-factor for he had the idea! 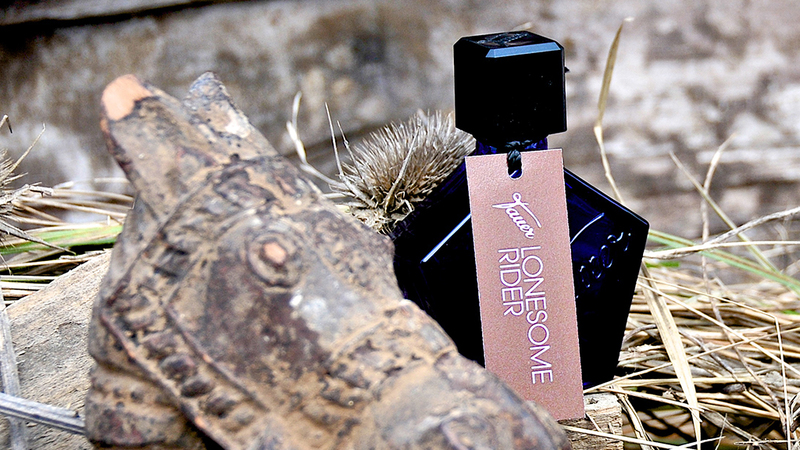 My goal was to come up with a cologne that is a bit more on the woody side, leaving a gentle layer of cedar wood (Atlas variety, from Morocco) and a glimmer of rockrose. I feel this might work. If not, we will do it again, slightly differently. If it does: Then we smile for a moment. And will start with the next one. I feel a cologne with a sandalwood allusion, and a hint of cinnamon or other spices might be wonderful. Or better even: an allusion of sandalwood with a halo of spicy rose oil. You see: I love, love, love working with neroli these days, a wonderful, yet highly expensive natural material. Expensive means: Yes, really expensive. 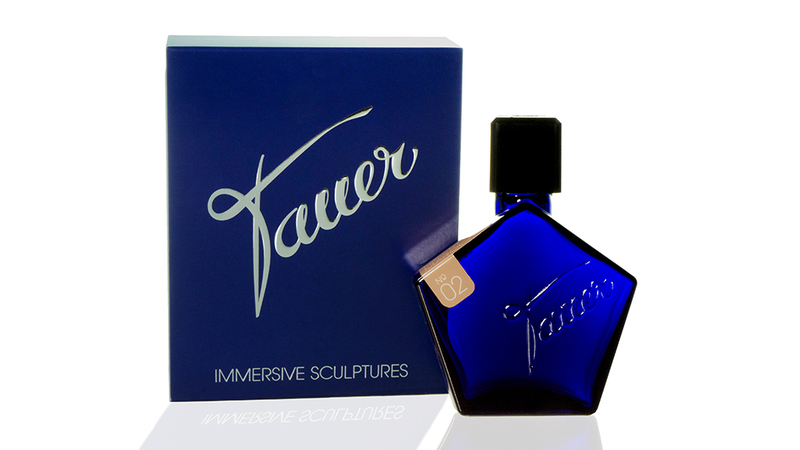 It is the steam distilled orange blossom, the neroli oil, that lets an eau de cologne explode in expensive sparkles. It is so beautiful to work with. I guess then I need a pause and then I will have a look at the latest babe in town. I got a gorgeous thyme CO2 extract to play with, some neroli, more rosmary, Lavender CO2 (out of this world) and litsea cubea and more...thus, happy playing ahead. But first: getting ready to finally say bye bye to some big boxes next week. And please: Enjoy your weekend! 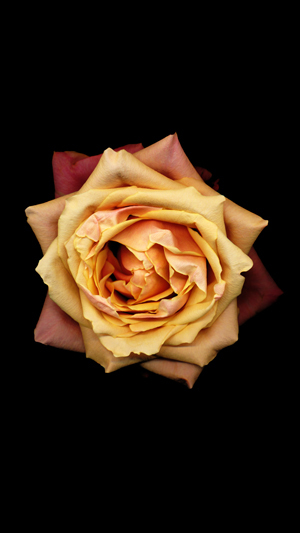 Today's picture: a rose, scanned. marketing and branding , what's up? Whenever I think French movies, I think sunflower fields and women cycling...Thus, I could not resist making this little video somewhere along the Rhône, after Lyon. 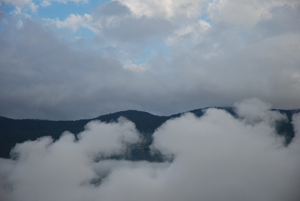 Here, back in Switzerland, I had my first encounter with rain since a while, and my meeting with the design gurus from Designers Club. We discuss the new inlay, that is going to replace the black paper that we use these days, wrapping it around the flacon. 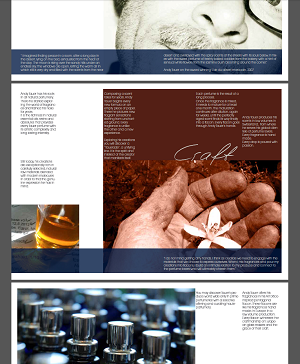 We aim at coming up with a nice paper inlay. No plastic, but a solid paper inlay, folded into place, holding the flacons properly. The aesthetics of the inlay should communicate hand made and hand assembled, yet still be a bit more practical than the simple sheets of paper crumpled around the flacon. I am in love, unconditional, with my new flacon. We get along very well, and even after days with dozens and dozens of bottles going through my hands while filling and crimping (=sticking the pump onto the flacon) and labeling, we still look at each other in the evening with a smile. For my gusto, the cover top is a bit too loose, I want it to stick stronger. This guy needs to go to the surgeon and needs a silicon enhancement. Today, I have a meeting with my Austrian cover top producer,who does a great job, by the way: Providing these cups made from beech wood, in time, in an outstanding quality. Let us see what we can do there! While I sit in meetings: Take your time and your chances to win a Carillon pour un ange over there on Scent-and-Sensibility (click here to visit Ronny's blog). Thank you for visiting here and there.